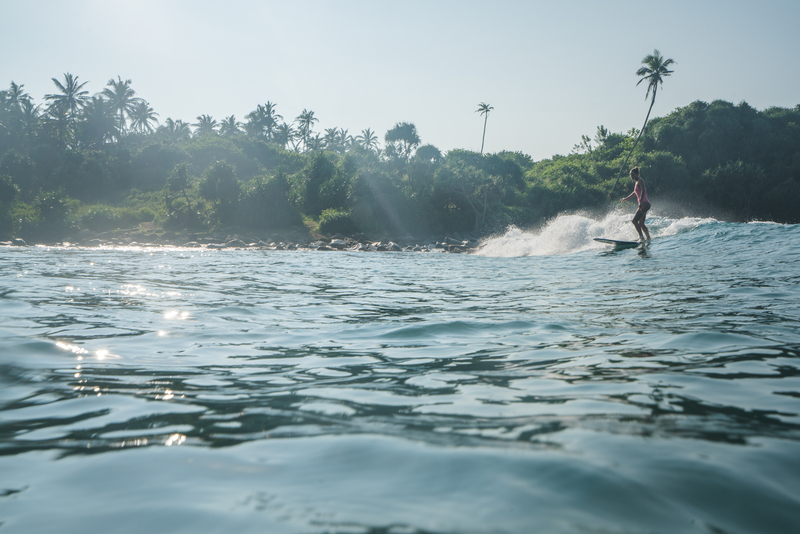 An artist, a surfer, a true woman of the sea, Nina Brooke has joined our artist residency program at Ceylon Sliders. We’re excited to have this artist based from Cornwall, UK here to use our backdrop to inspire her work during her stay. 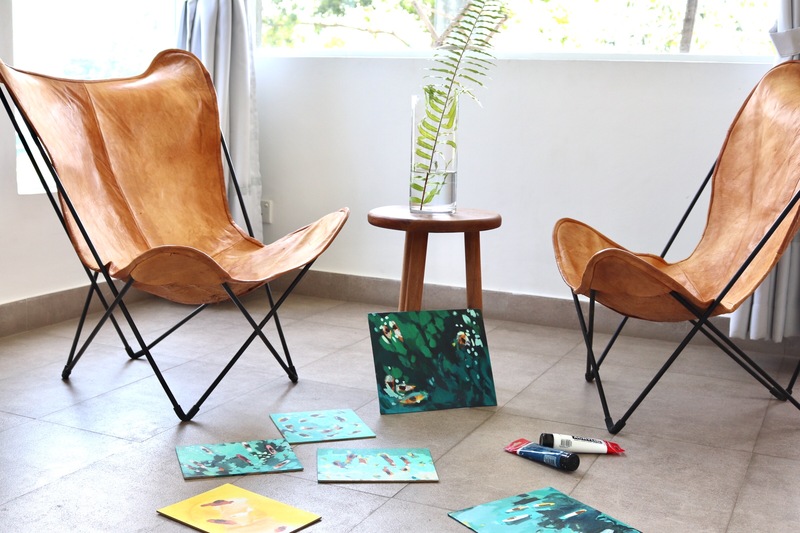 We’re on a mission to bring together a collective of creatives, in the hopes of cultivating a culture of art surrounding our beautiful environment here in Sri Lanka. While Nina is here, she’s been using the landscape and aerial images to inspire her artwork. Comprised of abstract structures, her artwork speaks volumes when it comes to encapsulating the beauty of the environment we work and live by. Join us next Tuesday evening, 21/11, at 7 PM for an art exhibition at Ceylon Sliders. 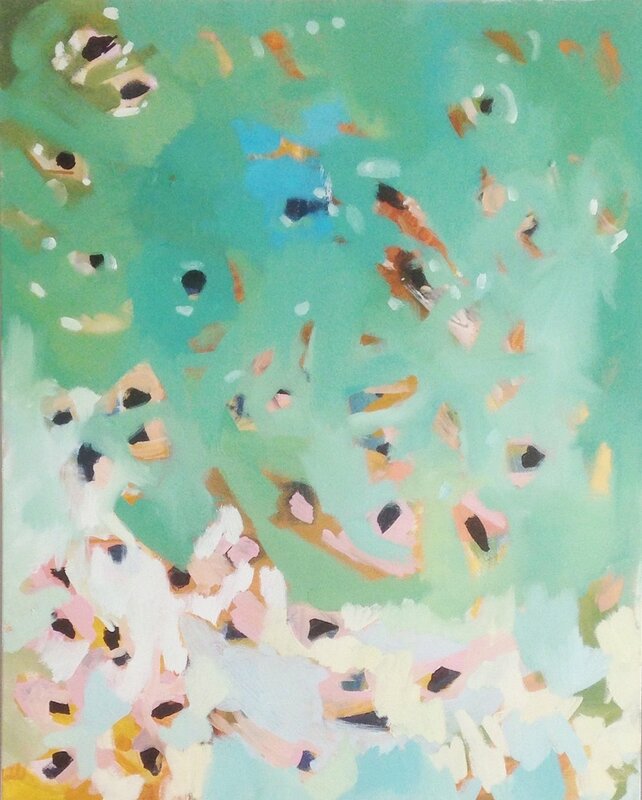 Meet the artist Nina Brooke herself, as well as her pieces inspired by the surf and the sea. Sign-up for the event here. Well, when I first walk into the studio I like to have everything really neat and tidy, then I get excited about making a little mess. I’m pretty quick to start, immediately mixing paints and getting the colors down the way I want them. I’m a fast worker, and I think it’s important to work all around the canvas with your energy while it’s moving. I always draw back to compositions I know work for me. I’ll have these creative spurts for like 2 hours, then break, and then pick up again for another 2 hours. I need time to reflect on my painting, so I’ll try to leave my work and go for a surf or a walk on the cliffs. I go into the studio at around 9 AM and then leave around 4 every day. It’s not a job, it’s not a hobby, it’s moments where I have to be in the studio. I have to give myself a chance to do it. It’s often that when you’re creative you get blocked, but you have to give yourself a chance to work through the good days and the bad days. I need a structure to my day, otherwise it would just become a hobby. I truly feel that what you put in is what you get out. I always want to be learning and moving forward all the time. 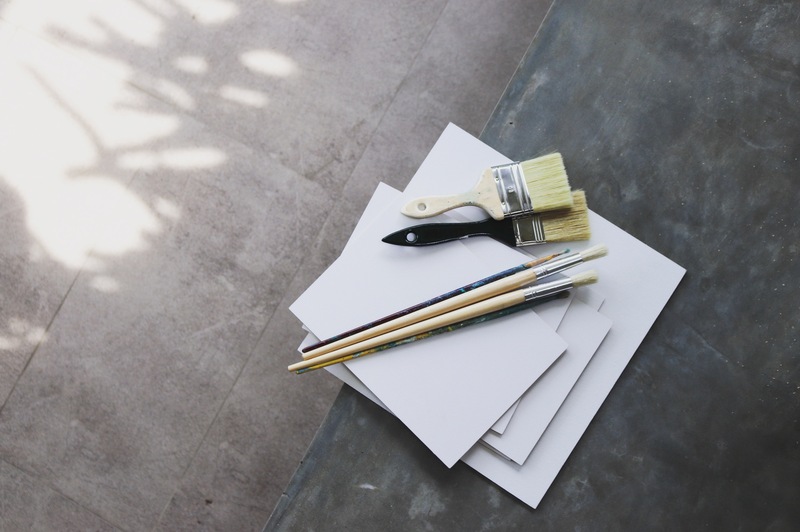 How have you incorporated art into your life? What is your background like? I started painting at a really young age and was taught by my grandfather how to paint and draw. I was never really good at reading or writing, and found I loved to paint. Every single school break, holiday, or spare moment I was painting. It helped that I was encouraged by family and friends. I went to study fashion at school, because I didn’t want to put all my eggs in one basket so to speak. Even at University though, I was doing paintings and incorporating them into textiles. I was trying to put it away and was fairly determined not to be an artist. After a while, I was working in fashion and my best friend said “why don’t you just commit to it [art] for 6 months and see what happens?” I was a bit afraid to committing to being an artist full time because I didn’t know what could happen. There’s also this image of the lonely artist – something I was afraid of. But after committing for that 6 months, and ever since then I’ve realized you don’t have to be that. Coming to Sri Lanka has only proven that part. As far as my background, I’m from Cornwall, UK. My mother is Dutch and Carribbean, and my father is from England. They met sailing the world together. I was brought up on the sea, starting at being 2 weeks old. I would say that half of my life has been spent on the sea (I do still get sea sick all the time). I have quite a free spirited family, and I’m actually the only one living in the UK. What role do you hope to play in society? I think I’ve taken more and more stepping stones towards a path to sustainability and focusing more on what the earth gives to humans. A lot of people are already aware of it, of course, but it would be great to put it into an art form to share. With drone footage and aerial photography I feel that it has helped show how much humans play a role in impacting the early. I also recently saw a film called Beautiful Planet that highlighted some success stories where humans have done their part in sustainable efforts. I think I’m still working out what my role is in society, but it would be great further down the line for my work to make that happen. What has been your favorite piece of art and why? Okay sorry, but I have two! Usually it’s always the first piece of the first collection of work I’m doing on a new subject. It’s always like this happy accident, and you’re not caring whether or not anyone wants it, you’re just trying new things out. The first one I did was a giant shipwreck that landed on the sands in Cornwall. It just has history oozing out of the paintwork and a vibrancy that I wanted it to have when I was creating it. The second is the third sea swimmer painting that I did. It’s quite abstract and has a lot of energy put into it. Every time I look at it I wish I could do it again – but I can’t. I think this painting is what kicked it [art] off for me and my work. I kept both of these pieces because they remind me of a moment. They might not be my best pieces, but they mean a lot to me. What has inspired you from Sri Lanka thus far? Everyone at Ceylon Sliders has been really inspirational, welcoming, and happy. The first morning I was here I paddled out amongst the fishing boats into the reef, and I could just imagine what it would look like from a bird’s eye perspective and wanted to work from that moment and that memory. 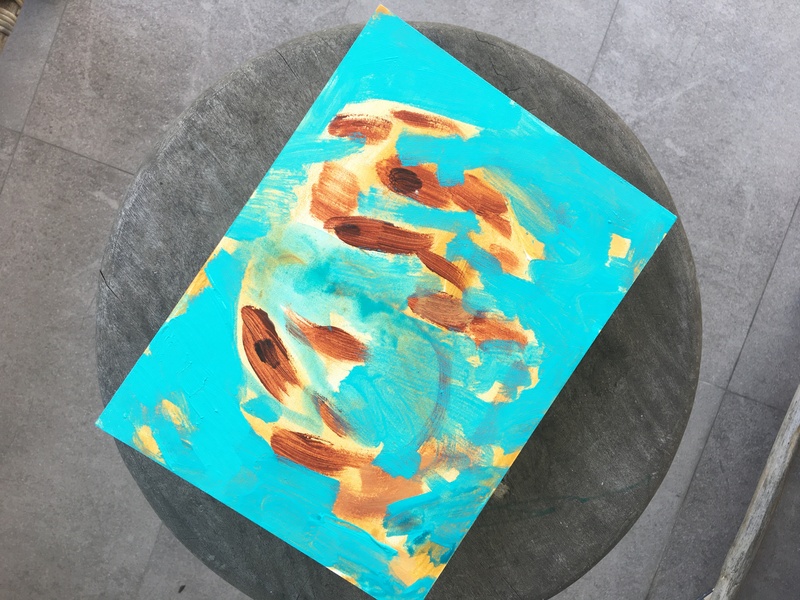 I think most of my inspiration here is through surfing and the colors of the water here. Just looking out from the balcony, you get immediate visuals and energy to put into artwork. That color of that water out there, it’s just something you want loaded onto a brush. Truly aspiring, talented young lady, with salt water in her blood and greatly passionate for what she does. I wish her luck although not needed as it sells it’s self with the energy she delivers in her work.